We are a leading Manufacturer of forming press from Bengaluru, India. Counted as one of the renowned manufacturers and suppliers, we are involved in offering a wide range of Forming Presses. These are engineered from top grade components which are sourced from trustworthy vendors of the industry. technically advance range of these devices are admired for their rugged construction, effective performance and durability. 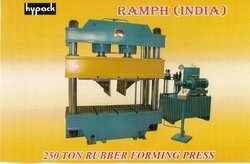 These are widely used to manufacture various rubber products. Looking for Forming Presses ?